Have you ever made something from memory, and then gone back to the original recipe to find that you mixed it all up? That’s what happened here, but that is not to say that the results are not still delicious. This is sort of one of Jacques Pépin’s Fast Food recipes. 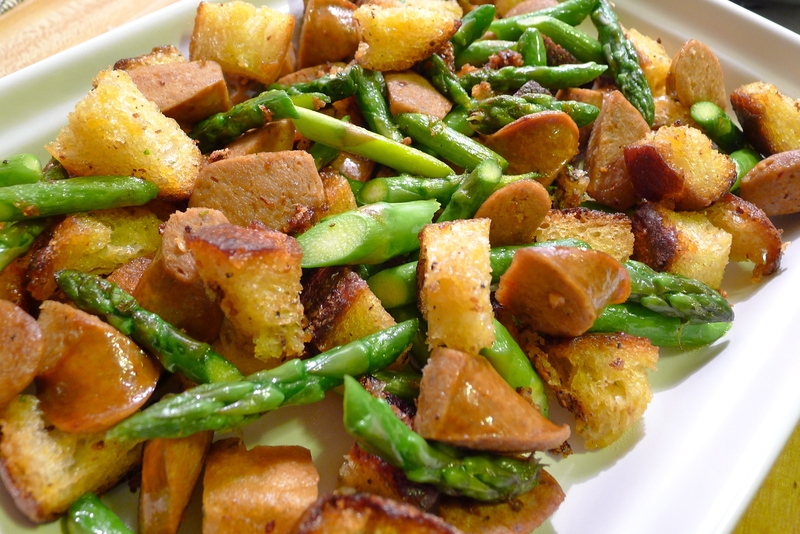 I’m sure that his is better, but the basic combination of chorizo, asparagus, and croutons is delicious — with or without the almonds. I adore Jacques Pépin. If I had to pick anyone living or dead to have a meal with, it would be him. Famously frugal, I saw him once on PBS make adorable garnish mice out of basically garbage. He can do that and I would eat it because he’s Jacques Pépin. Unbelievably awesome. The man is a walking legend. 1. Place the cubes of bread in a large bowl. Drizzle them with olive oil, and season them with salt and pepper. Sprinkle them with the Parmesan and toss everything together again until the bread cubes are evenly coated. 2. Heat about 1 to 2 tablespoons of olive oil in a large skillet set over medium-high heat until it begins to shimmer. Add the chorizo, the asparagus, and the bread to the skillet. Toss and stir everything together for about 5 to 6 minutes. You want the chorizo to brown, the bread to toast, and the asparagus to cook through.